More than half allopathic doctors prescribe ayurvedic medicines! 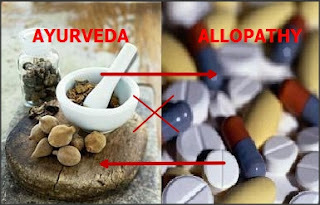 If you are dependent on ayurvedic medicines prescribed by your allopath, then you better think again before taking your next dose. Your doctor is as ignorant about ayurvedic medicines as you are. A study by the pharmacology department of KEM hospital has revealed that most of the allopaths who prefer prescribing ayurvedic medicines for ailments like liver disorder, arthritis, cough and cold, kidney stones and piles, have little knowledge about them. According to the study, 99% of the resident doctors did not even learn the basics of ayurveda but 67% of them prescribe ayurvedic medicines to their patients. While Dr Subodh Kedia, former president of general practitioners association (GPA), agrees that many allopaths do cross-section practice, he strongly discourages it. ‘I have never encouraged cross-section practice. One who is not aware of the medicines, shouldn’t prescribe them,’ said Dr Kedia. The study states that the commonly prescribed proprietary ayurvedic medicines were Liv 52 (39%), Shatavari (13%), Cystone (12%) and common ailments for which these medicines prescribed were liver disorders (34%), arthritis (18%), cough and cold (13%), kidney stones (11%), and piles (10%). Dr KR Kohli, Dean, RA Podar Ayurved Medical College, said though the law does not allow allopaths to prescribe ayurvedic medicines, one can prescribe it if s/he has the knowledge about the medicine. ‘As per the Maharashtra government’s notification, while ayurvedic doctors can practise allopathy as it’s part of their syllabus, an allopath cannot practise ayurveda as it’s not included in their syllabus. However, I am not against allopaths prescribing Ayurvedic medicines,’ said Dr Kohli. However, Dr Kohli rued that while allopaths prescribe ayurvedic medicines, they don’t show any inclination towards learning about the medicines. ‘At least 90% of these doctors basically rely on the reputation and credibility of the manufacturer, instead of knowing the content of the medicines. This is what needs to be changed,’ he said.